If your SD card is no longer functional you need to send it to a data recovery company. Here are some common faults to look at before trying to fix or repair your damaged SD card. With the exception of file system corruption no faults are user repairable without special hardware tools. SD Cards are very fragile; because of their thin components and case, they’re especially susceptible to bending and cracking. Depending on the brand the NAND microchip storing your data may be located on the top of the card (eg: SanDisk), bottom (eg: Transcend), or top & bottom (eg: Lexar). 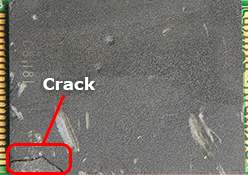 If the NAND memory chip is physically cracked recovery isn’t possible however it is possible that only the case or surrounding circuit board is damaged and the memory chip is fine. SD Cards have a mini computer inside them called a controller, their operating system is called firmware and FTL metadata is in part the mapping information which tells the SD card where to locate data inside the NAND memory chip when requested by the computer. Buggy firmware and cheap memory can cause SD cards to fail when large amounts of data are written to the SD card succinctly. For example, if the card can’t erase enough garbage blocks in time, incurs a buffer overflow and overwrites the FTL Meta Data structures. Another example would be the camera battery dying while shooting video causing the last written page to be uncommitted possibly corrupting the all the metadata. Sometimes the camera can appear to be writing data to the card when the card has actually failed because the camera caches preview images of each picture or video key frame. This type of corruption can’t be repaired or fixed without the aid of a special NAND reader and professional software that will reconstruct the mapping tables. If the SD card was just slightly bent it’s possible that just the circuit board (PCB) was damaged resulting in torn or lifted pads (ie: The traces are ripped from the circuit board but still attached to the NAND memory chip.). Removing the NAND memory chip, reading the data and reconstructing the FTL Metadata is often the only way to recover the data if repairing the tiny wire traces beneath the NAND chip isn’t possible. Monolithic SD cards are highly specialized devices that take special tools, skills, and knowledge to work on. Monolithic SD cards are inexpensive to produce and have a small form factor making them perfect for SD and MicroSD applications. Monolithic cards aka Chip on Board (COB) are commonly used by SanDisk, PNY, and some Lexar SD Cards. 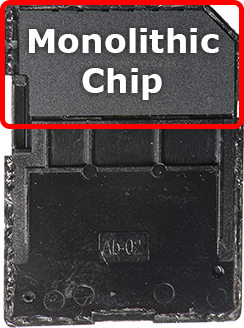 The monolithic chip is located at the top of the card and is very sensitive to pressure. Usually, the bottom of the SD cards is hollow. Repair typically isn’t possible except for saltwater cases. Assuming there is no internal damage to the card the only way to recover data is by reading out the memory chip directly. Most monolithic SD cards have some sort of interface for allowing direct communication with the memory chip, however, the specifications are almost never published. 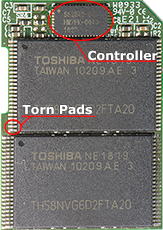 To interface with the memory chip requires reverse engineering of the chip to locate which signals correspond to which pad. Recover My Flash Drive has been a pioneer in flash media data recovery for over 11 years if you need your data recovered we can do it fast, securely and confidentially. We specialize in SD (Secure Digital) media and have an industry best turn around time. Click here to send us a data recovery job.